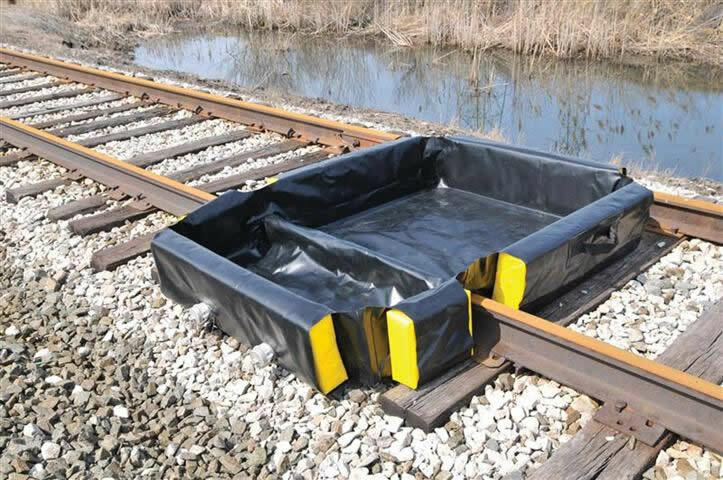 THE EASIEST, PORTABLE RAIL SPILL CONTAINMENT BERM AVAILABLE. This lightweight containment pad is designed to provide a temporary bermed containment area around the valves below a rail tank car during loading/unloading operations. Only 80 lbs, it can be easily lifted into place by two operators! The berm provides a 4’ x 4’ x 12” H berm area that sits in the void between the tracks directly under thevalves. 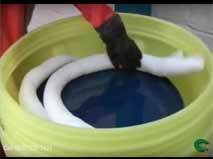 Should a large release occur, captured product would begin to fill, this berm; the spilled product would then be directed over the outside rail to a side compartment 4’ x 18” x 12” H. This outside compartment is fitted with two 2” drains that includes a male CAM-LOC fitting for quick coupling of system to hoses that can transport the spilled materials to a nearby catchment area.